Dr. Savaş Alpay, Director-General of SESRIC, paid a courtesy visit to the Harvard University on March 22nd, 2012. The Director-General was received by Mrs. Jackie O’Neill, Marshal of the Harvard University, on behalf of Prof. Drew Gilpin Faust, President of the Harvard University. The courtesy visit took place in the historical Wadsworth House, which was built in 1726 for the president of the Harvard. During the visit, Dr. S. Nazim Ali, Director of the Islamic Finance Project (IFP) at the Harvard Law School, was also present. Dr. Alpay expressed his sincere appreciations to the Harvard University administration for promoting research in Islamic finance through Harvard University Islamic Legal Studies Program (ILSP) and its IFP. Dr. Ali extended his thanks to the Director-General for his invaluable contribution and support to the Tenth Harvard University Forum on Islamic Finance by participating at the event as a plenary speaker. He highlighted that the Forum had been receiving significant interest from the stakeholders all over the world and would continue to do so. Throughout the meeting, Mrs. O’Neill and the Director-General had highly interactive discussions on a broad range issues including, inter alia, the growing role of Islamic finance in the global financial system and the recent developments in the Muslim world. 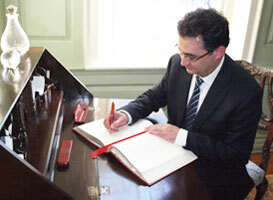 As part of his courtesy visit to the Harvard University, Dr. Alpay was invited by the University Marshal to sign the Harvard University guestbook.